I used Copic pens and Spectrum Noir pencils to colour this digistamp. 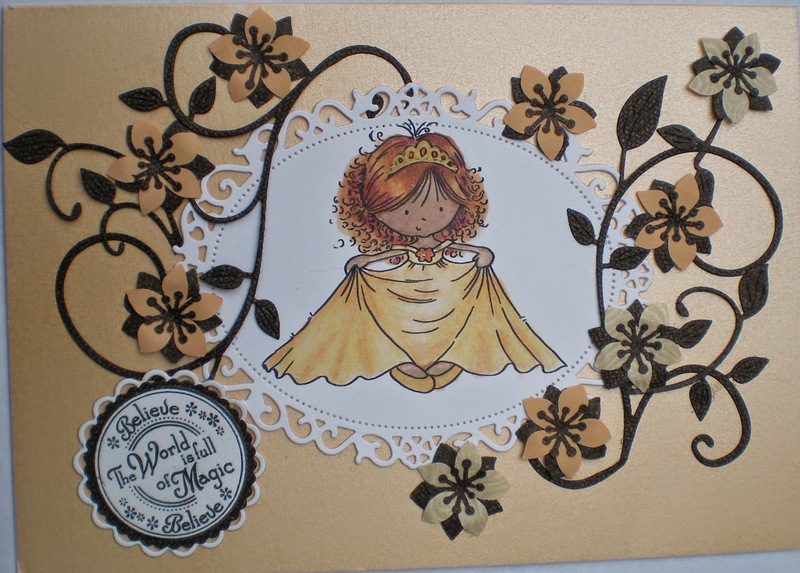 She has been cut out using a Spellbinders Floral Oval die and surrounded with flowers. Two different spellbinder dies were used to make the sentiment which has been stamped using a Lili of the Valley stamp. So very pretty and I love the colours. Thank you so much for sharing your lovely creation with us at Through the Craft Room Door. This month is use a stamp or digi and you did a great job! Thank you for joining us at Crafts Galore Challenge. I hope you’ll join us in our next challenge. I live in Kent, England with hubby. We have three boys and one beautiful granddaughter. I like to make cards, scrapbook, knit, crochet, cross stich. As you can see I love all types of crafting.